It’s that time of the year again. Summer is all about enjoying ripe, juicy mangoes. In the sun. With fresh cream lathered on top. And maybe even a little champagne! Mangoes make summer just that little bit sweeter… But slicing them? Not so sweet. Unless you’ve got Avanti’s Mango Slicer, that is. With one quick, swift movement, this handy little tool deftly slices your mango into two, separating the centre from the two halves, so it’s ready to enjoy straight away. And, thanks to the piece at the base of the Mango Slicer, there’s no mess, either. Enjoying your favourite summer fruit is easier than ever, thanks to Avanti! Made from durable plastic, with a sharp, stainless steel blade. 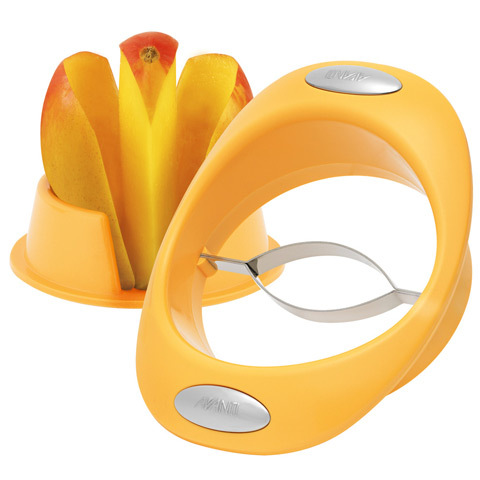 Two handles allow you to effortlessly slice your mango into two halves by pressing down gently with both hands on either side of the Mango Slicer. The stand at the base holds your mango upright while you cut it – and collects the mess, so there’s no need to clean the benchtop afterwards.